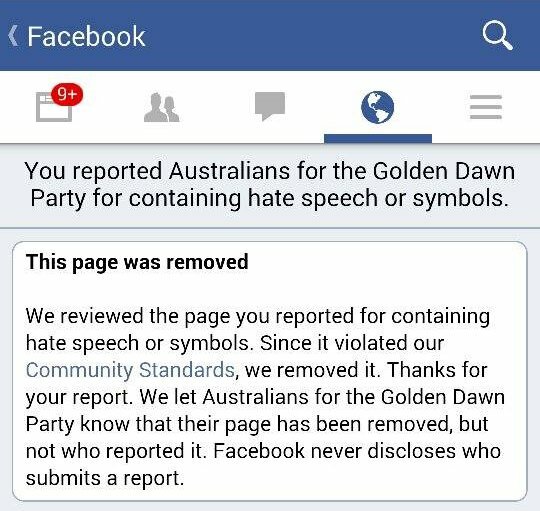 Updated: 12 May 2014, 6pm – earlier today OHPI wrote to both Facebook and the Australian Human Rights Commission to notify them of our work on the Australians for Golden Dawn page. 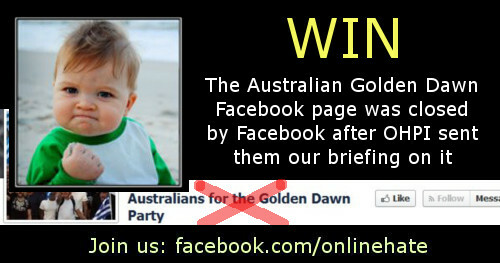 Following those e-mails we’re please to report that the page has now been closed by Facebook. 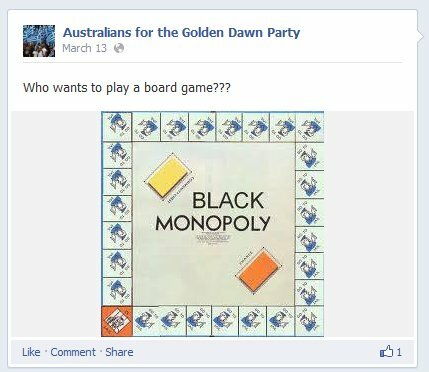 Since publishing OHPI’s briefing on Golden Dawn in Australia, and the hate they are promoting on Facebook, with your help we’ve had a fair number of images taken down by Facebook. Some of the content, however, is still live. The briefing includes details of the response to our report by Jim Saleam and his Australia First party. 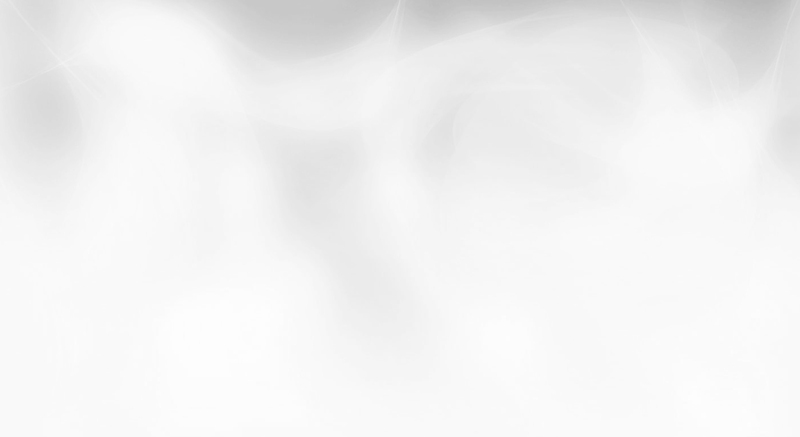 It also gives an update on what still needs to be reported, and details of what has been removed. 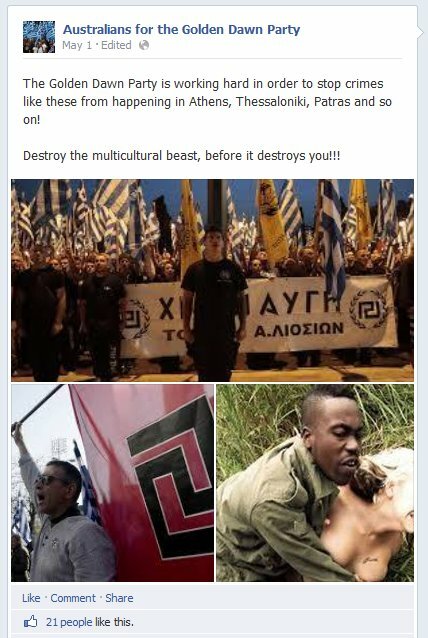 We’ve had enough hate speech removed from the Australian’s for Golden Dawn page to count this as win, but please do continue to report both the content below and the page itself. For those interested, OHPI’s CEO has also published two articles about this incident, one in Jerusalem Post and one in J-Wire. These articles provide additional context to the briefing. 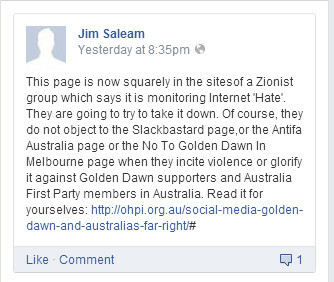 Jim Saleam, President of far-right Australia First party, has found our briefing and has recommended the supporters of Australians for Golden Dawn read it. That’s probably a good idea as some of them might have jobs, family or friends who would be decidedly unimpressed to see them associating with someone like Jim (for Jim’s background see the briefing). For the record, Jim, OHPI is a harm prevention charity not a Zionist group. 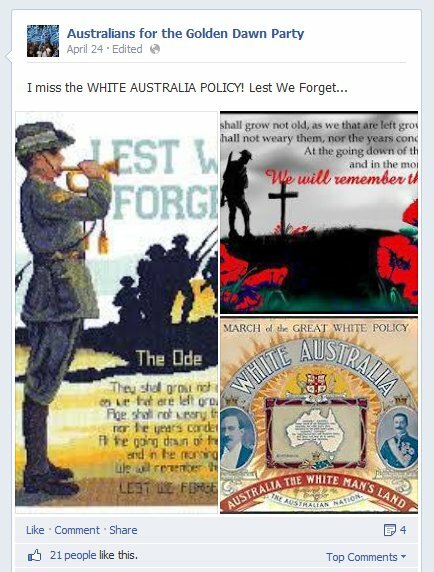 We did, however, grow out of a project based within the Zionist Federation of Australia – so we’ll give you half marks for that. 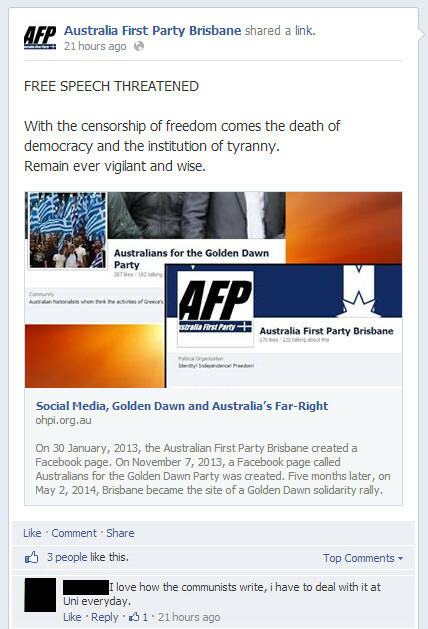 It’s interesting to note Jim’s complaint, above, about nothing being done to censor those opposing fascism, and to compare it with the post from Australia First below which advocates absolute freedom of speech. Jim Saleam himself is not always a fan of free speech. A few years ago he lodged a complaint against the Good Weekend Magazine. At the time he was objecting to their exposure of his Lebanese ancestry, the assertion he was repeatedly involved in Nazi activities, and what he described as bias. The article quoted Dr Michael Monsour, a medical doctor in the town where Jim Saleam grew up, who said, “That’s the crazy thing about all Jim’s Nazi goings on… if Hitler was about today, Jim’d be lined up against a wall and shot — he’s certainly no Aryan”. The ruling by the Australia Press Council held that the article “concerned matters of legitimate public interest to which the assertions in it were relevant and supported by a reasonable degree of evidence, including photographs and judicial decisions”. Six other complaints by him (all dismissed) are discussed here. All this having been said, if Jim does find people are advocating violence against him (or anyone else) through Facebook, or any other online platform, we’d encourage him to call the police and report it. 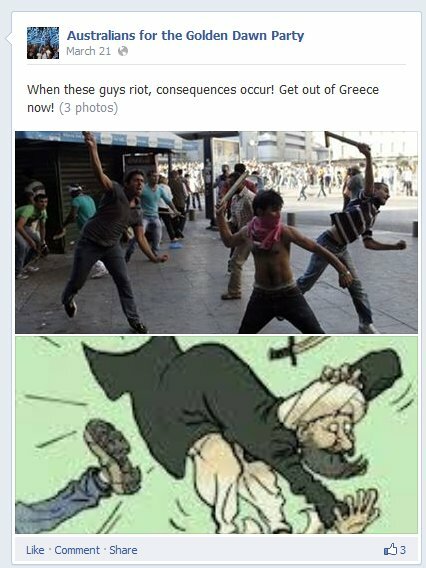 As the son of an immigrant, and someone with Lebanese ancestry, we’d also urge him to be careful when hanging out in person with Greek neo-Nazis. Urging supporters of Golden Dawn to read our briefing, which linked to a copy of the Good Weekend profile on him, may not have been a very smart move. 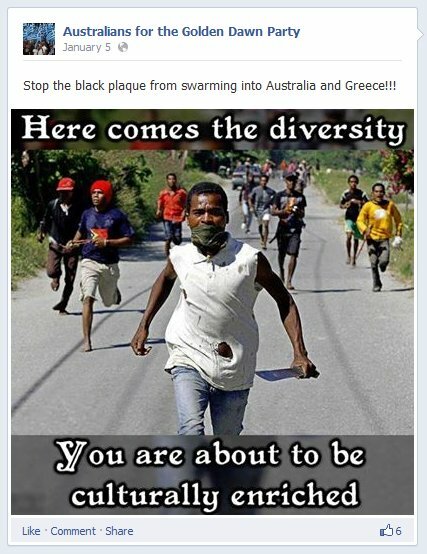 Still, Jim does have a PhD from researching the Far Right in Australia, so perhaps he does know what he’s doing. These items have not yet been removed. Links to report each item are provided below, you may find our instruction on reporting a Facebook post helpful in reporting these. When you have done, that please visit the page and report it as well (instruction here).